On Saturday 25th August 2012 WRFFA held it's Members Boat Competition. With weather forecasts promisiing heavy rain showers and thunder storms all entrants were delighted to experience another 'got it wrong day'! There were a couple of odd showers but for the vast majority of the day it was a pleasure to be out on a boat. Fishing was not easy with a range of results from nil returns from some of our 'seasoned' anglers to a few full bags of 5 fish. 1st place: Dave Wells with a 5 fish total weight of 11lb 12oz. 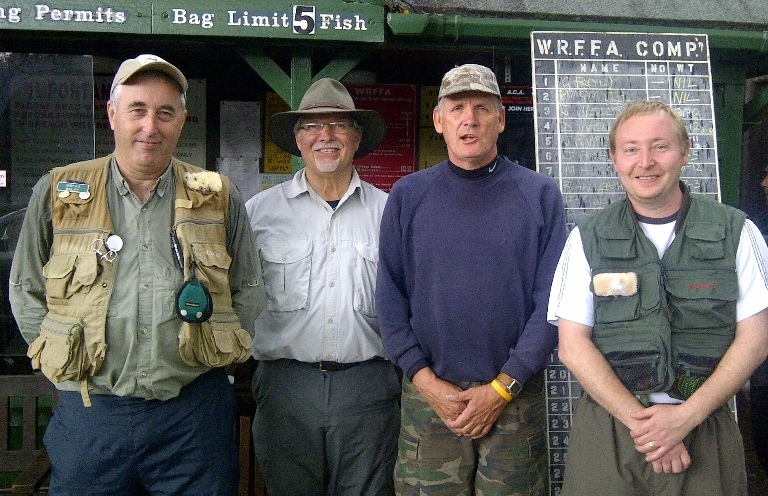 2nd place: Paul Godwin with a 5 fish total weight of 10lb 12oz. 3rd place: Ken Pascoe with a 5 fish total weight of 10lb 3oz. 4th place: Mark Hogg with a 4 fish total weight of 8lb 4oz. Well done to Dave Wells who also won a prize for the heaviest individual fish of 3lb 10oz. Picture: left to right; Paul, Ken, Dave, Mark.